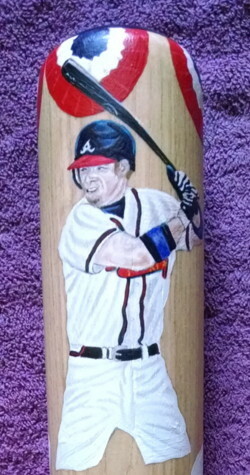 All of my Legends Hand Painted Baseball Bats, are a one of a kind work of art collectible. Nobody else will own one like yours. Choose any player, past or present. All time favorite broadcaster. Maybe you are still playing baseball and would like a bat of yourself? Or your Son or Daughter? I have three levels of pricing to suit every budget. Player's portrait, team logo, player's number. 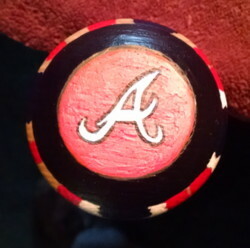 Also the "ring" around the bat with another team logo. Add flag bunting and team logo on the top of the bat. Also an "action" painting of the player. Add player's stats and name. 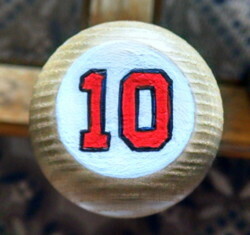 Also player's number on the knob of the bat. My signature and the date this bat was completed will be on every bat. Also, "1 of 1". This means that this bat is a one of a kind collectible. I'll never paint another bat exactly like yours. I use 34 inch, full size Rawlings wood bats. 25 to 30 hours of work go into each one of my hand painted bats. All the painting is done directly on the bat. Please Allow 4-5 Weeks For Completion Of Your Bat. Shipping is always FREE within the Continental United States. Please add $19.00 for International Shipping. This includes Canada, Alaska, Hawaii and Puerto Rico. You pay nothing until your bat is completed. Order Your Legends Hand Painted Bat. 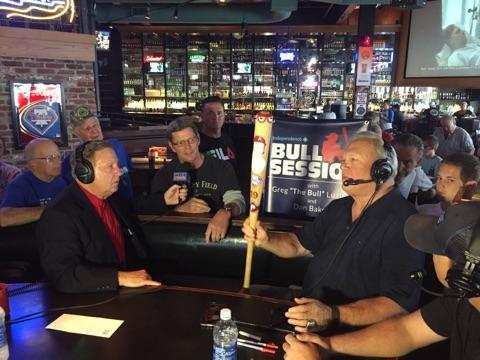 Recently I had the opportunity to present Phillies Legend Greg Luzinski with a hand painted bat I did just for him, live during his "Bull Session" radio program. The Bull absolutley loved it. 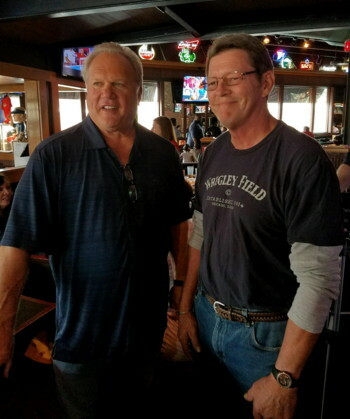 That's my good friend, Phillies stadium announcer Dan Baker on the left, me in the middle and Greg Luzinski with his bat.